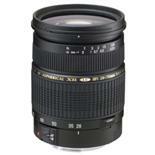 The Tamron SP AF28-75mm F/2.8 XR Di LD Aspherical [IF] MACRO utilizes the same size reduction technology developed for the popular Tamron 28-200mm & 28-300mm Super Zooms. The AF28-75mm is the world's lightest and most compact fast standard zoom lens* . * As of August 31, 2002. Based on Tamron surveys of lenses in the same class.This lens represents the first in a new category - a zoom lens that can be used comfortably as a high quality fast standard lens for both silver-halide and digital photography.